Second Harvest revisited: animal and wildlife suffering and sacrifice in the name of non-performing, disastrous “green”. The European Treaty of Amsterdam, 2001, while not law, yet outlines various welfare standards for fur bearing animals. It clearly states that animals that are kept for commercial reasons are “considered as living and sentient, in the sense that they are able to experience pleasure and suffering.” It prescribes that animals must be kept in a “safeguard” to avoid suffering and respecting their needs, including being allowed to “show certain behaviours.” The Treaty goes on to reference that non production, or low production rates, will reflect on the ability of the farmer to prove adequate welfare. In the instance of farmer Kaj Olesen Bank, his ability to provide welfare and care was severely tested by an array of four wind turbines. While some farmers use the term “Second Harvest” to benignly refer to their welcomed scoop of the wind money harvest from hosting wind turbines, a more sinister meaning is clear for home grown environmentalism. This “harvest” involves the widespread and now more fully understood feature of animal suffering and death, ugly killing fields, associated with the now equally understood uselessness of wind “factories.” This “harvest,” was ever more evident in the recently exposed suffering at a mink farm in Denmark, where aggression and abortions, and eyeless foetuses appeared as a direct cause of a new turbine installation. Kaj Olesen Bank is a neighbor of four huge wind turbines, located a mere 330 metres from a mink farm with several thousand animals (about 4600). While neighbors wrote to the municipality about negative consequences for their families from shadow flicker, quality of life issues as well as concerns for their property values, little did they suspect a direct run on animal suffering and death. There were two separate incidents reported of deaths and aggression, but the second, it appears, was less easy to bury. It was this second grouping of reports, with photos, that have begun to entirely capture the heightened awareness world wide of cruelty to animals that occurs within radii of industrial wind turbines. In this instance, the turbines are not required to be located at the same setback as for a human residence, and the results for animal residents, cannot be clearer. Some Danes are calling these results of mink experiences via turbines a shocking “mass animal experiment” without benefit of any compassion or testing standards. The relationship between the deaths of foetuses, with deformities, the aggression of the minks who then had to be separated and some euthanized, and the turbine activity, is clear and undeniable. What then will be and are the admitted results on humans routinely experimented on, placed too near turbines? For Health Units worldwide that apparently disguise or minimize harm from turbine placement, this animal ‘experiment’ should ring clear and loud, that sample literature surveys, biased, are absurd and insulting to people affected, who cannot even at times live in their own homes: evidence such as reports to personal physicians, to various Ministries of the Environment and Health, and the sheer weight of obvious similarity of complaints, should be sufficient for world level moratoria. In a country that recently created a very progressive landmark law against cruel slaughter in some religious practices (Denmark recently, 2014, banned halal and kosher slaughter, it’s Minister decreeing that animal rights come before religion), the shock of the obvious torture and deaths of so many mink is even more poignant. But aside from the incongruities of animal rights within Denmark, Canada, the USA, and inevitably every other country with “animal relationship cognitive dissonance,” the turbine lies of green, free, cheap, and CO2 saving, sit directly beside a very real parallel universe: a universe that destroys habitat, maims lives of nearly everything in sight, from audible and inaudible noise and pressure, vibration, shadow flicker. It is well known that mink are highly active animals and have as all creatures, complex lives, and DNA driven responses to low frequency pressures and vibration that naturally affect their sensitive natures. Indeed, the owner of the farm reported that the animals appeared to have “gone crazy,” biting, fighting, the tension and aggression between nesting animals and vicious injuries requiring euthanasia. Wind turbine wildlife hell and for “husbanded” animals, is well known throughout the world. There is nary a turbine area, small or large that has not had reports of this suffering and loss. Raptor and endangered species reductions, migration routes sliced routinely with rules to defend wildlife completely in favor of developers, disappearance of amphibians, turtles, moose, worms, disastrous effects to farmed animals, EMU, goats in Taiwan, cattle still born, noses bleeding, deformed, chickens laying eggs with no yolks, exploding lungs in bats already in serious decline, declining levels of butterflies, all manner of birds slaughtered, even those brought back from the brink of extinction; the list of collateral damage “Second Harvest,” is too lengthy to reflect on here. Farmers from North America routinely struggle with harmed and decreased livestock, often down as much as 30% in production, and feel acutely the suffering of their animals. Wind turbines don’t work. It’s been said so many times, in so many ways, that it is nearly now completely redundant to remind ourselves of the failures. They at times, many times, consume more parasitic power than they create. They are notorious for having down time, not performing, or needing to be shut down when it’s too windy. They don’t last very long either, 10-15 years. California has 4500 burned out turbines, abandoned. Piles of industrial eco junk are accruing worldwide. The UK has had 1500 industrial accidents in five years. And those cement plugs? Not one has been removed. But along the way to the subsidy and loan guarantee bank, comes a bigger price, not borne by environmentally sensitive developers. The result of their “work” is resolute carnage for living things. (We use the word, resolute, because of the intensity with which developers, with participation of government policies, turn environmental law to their will.) 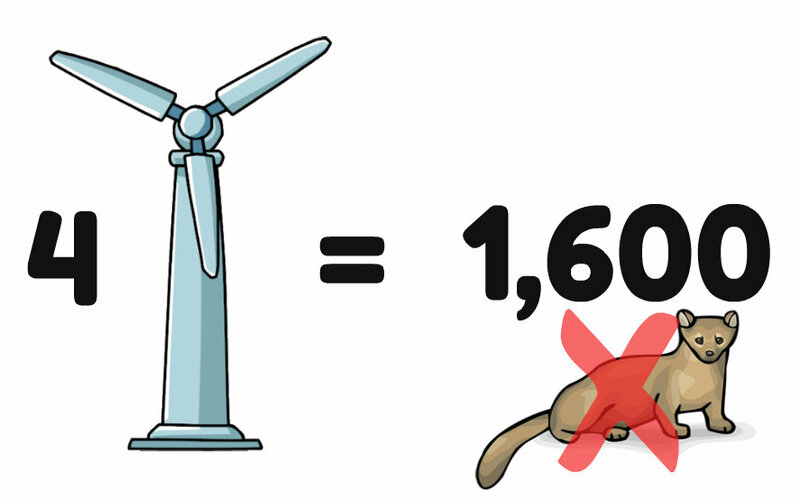 Turbine proliferation has resulted in numbers of dead and dying we cannot yet contemplate. Every species is affected. Industrial wind turbines are the most useless form of energy conceivable, and to imagine that they will reduce our impact on the earth, while consuming wildlife, our farm animals, human health, property values, landscapes, while using volumes of metal, plastics, oil, lubricants, gas, highly toxic rare earth elements from China, cement, 40 truckloads per turbine, polluting aquifers, and providing absolutely nothing beneficial, is absurd. Our dissonance about animal welfare and protection is only mirrored in our lingering affection for something pretentiously false and sad: industrial wind turbines. A golden eagle is found wandering, starving, one of thousands in such a state, hundreds of metres from a turbine, obvious trauma and loss of wing. No developer reported on this or the thousands of other wandering mutilated birds. Foals in Portugal are affected by ground vibration and ILFN, with Flexural Deformities (The study was filed as a Master’s thesis, titled “Acquired flexural deformity of the distal interphalangic joint in foals.”) Estimates are of at least a billion birds and bats destroyed by wind turbines annually. “We are going to take the females/mothers away from the puppies, the wind turned into south yesterday, and the noise from the turbines came just over the farm, the females began to bite their puppies, just as I had expected. This is how it looks like now. Meeting regarding the launch of wind turbines behind K. B Olesen´s farm. Prior to the meeting of 9 September 2013, according Kaj, the following has happened: On Thursday and Friday afternoon, the two wind turbines which are closest to the farm were going through a test run. This was done in daylight. It was windy and the wind turbines could not be heard clearly, the minks responded with curiosity by getting out of the cages. that had very extensive fresh bite wounds and the wind turbines were stopped to prevent further dead minks, resulting in peace, but not the peace that was before the turbines started. damages. These figures should be viewed in light of the fact that there had been very few cases of bites in this period and that it will be normal on a farm of this size to find one bite a week. Right now it usually is a quiet period on the farm. Mundbjerg and Eric Abraham from Viind Estate, and Michael from Vestas. At the meeting Kaj explained again the events about the minks’ behavior after the turbines started. We all listened to an audio clip Kaj had recorded on the night of Friday, when all minks had gone crazy. It is obvious on the clip that there is a constant whining and screaming from the animals. We also heard an audio clip from the evening after where we only could hear small sounds of mink feet and the sound of rain on the roofs. be started. Kaj and I do not want the two wind turbines – which until now have caused problems – to operate at dusk or at night. Viind Estate would like to try to let the two most distant turbines operate day and night and then allow Kaj to call them and get them to stop if there occur problems again. The problem of this tactic is that if the animals become stressed up too many times, it will be quite impossible to get them to calm down again and so there will be fighting constantly. It is not possible to separate all minks from each other. Firstly, the farm is not built for it, because it is not usual procedure in a mink farm; secondly, a mink who goes alone would not eat the same as when they are together; this will result in a smaller skin when by pelting. Kaj Abraham has announced that Viind-Estate will cover Kaj’s loss including the additional work from the need to monitor the minks. Losses may be incurred on the farm in several ways at the moment: Animals that are bitten and treated, but end up with a lower settlement because of inferior quality skin. Animals that are isolated therefore achieve a smaller settlement because of shorter length of the skins. Problems that can arise during pregnancy, childbirth, etc. may be discussed later, if the problem is not resolved by then. It is impossible at this stage to say how long it will take for the mink to get used to the sounds of the wind turbines. After the meeting I prescribed antibiotics to treat bite wounds. This had also not been necessary in this season.